‘Get Kettlebell Fit’ is uniquely designed to make you get fitter and feel better! This class offers an exciting and different kind of training which targets almost every aspect of fitness, from endurance and strength to balance, agility and cardio. The beauty of the Kettlebell is that it works many different muscle groups and also provides a total body workout. This energetic class run by BodeeWorx is great for fat loss, and total body conditioning as well as being great fun too! Every Tuesday from 5:45pm – 6:30pm and only £6.50 per session. 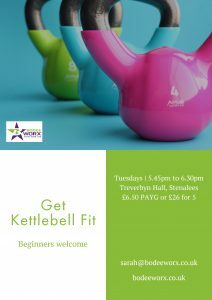 For more information on ‘Get Kettlebell Fit’, please call Sarah on 07842 779921. If you love this class, how about trying ‘Get Fit Stay Fit‘, also by BodeeWorx.